Soil erosion is the loss of soil from the land surface due to gravity, wind, water or ice. Erosion is a continual, natural process occurring in all regions of Earth. The loss of soil from the land surface can be detrimental to both terrestrial and aquatic environments by depleting nutrients, increasing runoff and affecting aquatic life. 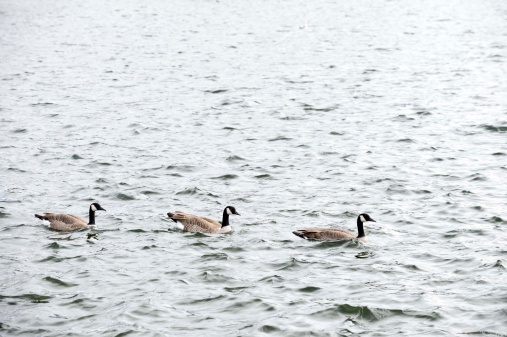 Soil erosion can affect the aquatic life that feeds geese. During the erosion process, topsoil generally erodes first. As the nutrient-rich topsoil erodes, the soil that becomes exposed is less likely to contain enough nutrients to sustain plant life. In agricultural areas that rely on nutrients for growth, the application of fertilizer is necessary to add the essential nutrients such as nitrogen, phosphorous and potassium to the soil. Property owners may also add new topsoil to increase the nutrients in an area. As the topsoil erodes, the process exposes deeper soil at the land's surface. This deeper soil often does not hold water well, is very compact and has reduced drainage capacity. Therefore, runoff increases in these areas. The loss of organic matter in the topsoil is the largest contributor to the reduction of water retention in the soil. To reduce water runoff, property owners must till the land and add either topsoil or organic matter to increase the ability of the soil to drain a significant amount of water and retain moisture for plant growth. Soil erosion causes sediment to accumulate in nearby lakes, rivers and oceans. Sedimentation in water bodies affects the ability of fish and wildlife to feed by making the water cloudy. Murky water makes it difficult for fish and wildlife to see well and find food. Some fish also intake the soil particles through their gills, which can affect their breathing. In addition to the change in water quality, soil particles that accumulate along riverbeds can destroy the areas that fish and insects use to lay their eggs. The soil can make such areas unusable and may interfere with the growth of existing eggs in these areas. The nutrients lost from the land surface as the soil erodes moves to the water bodies when the sediment accumulates. Some of these nutrients promote the growth of aquatic plants that are detrimental to the overall health of the water body. For example, increased concentrations of phosphorous promote the growth of algae. As algae prosper, they can cover the surface of the water, changing the appearance of the area and making life more difficult for other plants, fish and insects.